One of the biggest attractions at San Tan is Goldmine Mountain, which composes the majority of the north end of the Park and extends up to 2,500 feet in elevation. This mountain not only contains gold, silver, copper, iron and turquoise but a “Rich” history as well. Heavy mining activity took place between the late 1800’s and 1980, where prospectors were hoping to strike it big. During that time, there were 55 claims made on goldmine Mountain alone. Today the vast majority of the mining sites have been filled in, for safety concerns and only 5 active claims remain. Arizona Game and fish partnered with the Arizona State Mine inspector to fill in these potentially dangerous mines as well as to protect abandoned mines housing native wildlife. The “Bat Cave” is a mine that extends roughly 30 feet back and houses a small population of local and migratory bats as well as rattlesnakes and other creatures brave enough to venture into the dark. It has been sealed off at the front by steel bars to protect both the animals and humans who visit the area. The “Bat Cave Hike” is a popular ranger led hike which guides guests to the secret location of the cave and promotes responsible interactions with fragile species. This mountain seems to be a popular destination because along the way to the top of the mountain you can see amazing views, prolific wildlife, mines, and even the grave sites of Mansel Carter and Marion Kennedy (two miners who were associated with the Park’s mining history). Many visitors come to the Park in search of the “Man of the Mountain, ” a unique and iconic legend imbedded in the local history. Mansel Carter was his name, and he was a simple man whose passion warmed the hearts of both the people and wildlife that surrounded him. His story starts in 1902 near Quaker City, Ohio and takes him all over the U.S. working odd jobs as a mechanic, a pilot, a photographer, a sheep herder, and even a logger. After being drafted into the Army during World War 2, he finally decided to settle down in Gilbert, Arizona to manage a photography business in 1941. Here he became good friends with a man named Marion Kennedy, who was a Cherokee Indian from Oklahoma who delivered ice to Mansel’s shop. They would go on weekend mining adventures together and enjoyed it so much they decided to move to the Goldmine Mountains in 1948 to look for gold. For their first year on the mountain, the two lived underneath the shelter from a palo verde tree. They never struck it rich but between what they did find and a small pension Mansel received from the Army, they made enough to get by. As time went on Marion began to lose his eyesight, but still wanted to help in the mining adventures. Marion trusted Mansel so much that he would hold the chisel while Mansel would drive it into the rocks, not being able to see what was going on. His eyesight became too poor to be wandering blindly in the desert, so Mansel created a network of ropes that would help guide Marion around their campsite. In later years Marion Kennedy’s health slowly declined and he eventually passed away in 1960 from cancer and other complications. Even after Marion had passed, Mansel remained on the mountain and soon became a local celebrity. Travelers would visit him from far and wide to hear his stories, try his famous biscuits or buy one of his famous “Cactus Curios” wooden carvings. Visitors and animals alike were captivated by his charm and compassion. 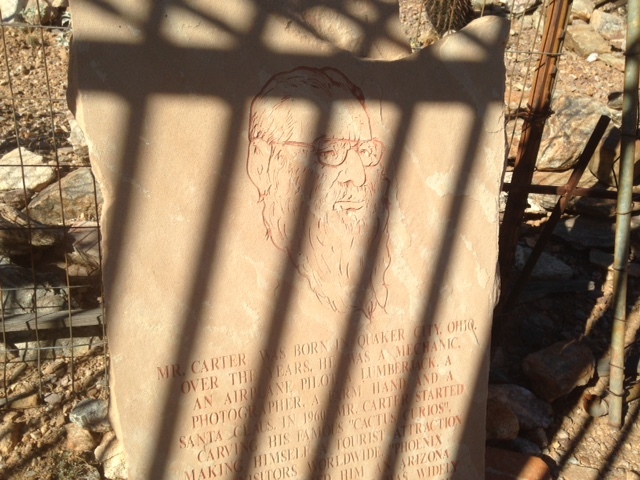 Mansel kept log books filled with the signatures of all the people who came to see the “Man of the Mountain.” The animals in the area trusted him; it was a common sight to see him with his pet quail, Maude, following him around the desert or perched on his shoulder. 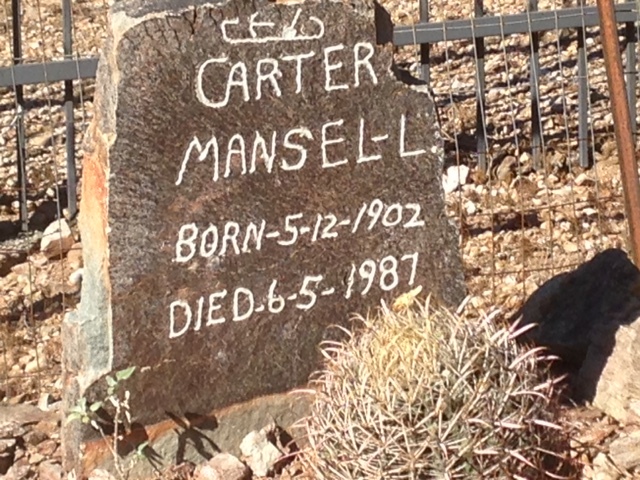 In 1987 Mansel Carter passed away and was buried next to his friend, Marion Kennedy, on Goldmine Mountain. 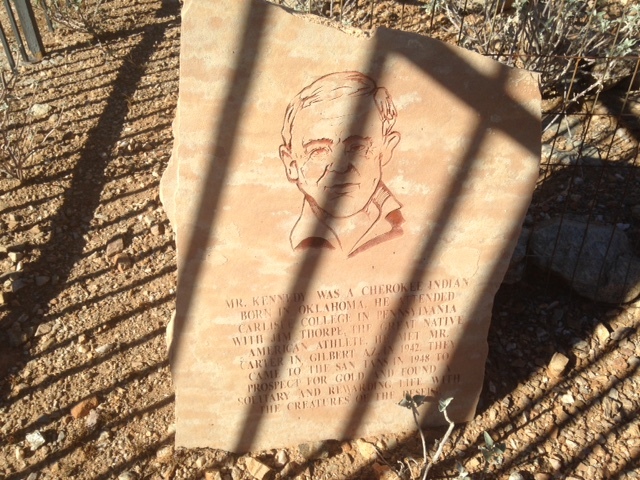 The grave sites of these extraordinary men can be seen on the Goldmine trail 1/4 mile south of the Goldmine trailhead in San Tan Mountain Regional Park. Bill and I spent the morning with our Park Supervisor at the Goldmine Mountain entrance today. This entrance to our park does not have a pay booth, but uses an Iron Ranger payment system. In past years there was little interaction with park staff at this entrance to the park simply because there was not enough staff to go around…. However, now that the park has four Park Hosts, we rotate responsibility for going to the Goldmine entrance. We spend four hours per shift, three days a week, interacting with the visitors, making sure they know how to use the Iron Ranger (to avoid receiving a failure to pay ticket), answer any questions they may have and are there to welcome them in and help educate them on safety concerns… We bring water and a first-aid kit with us just in case anyone is in need… but mainly we are there to provide great customer service to the folks that utilize the Goldmine entrance of our park. Naturally, this being our first time at the Goldmine entrance… Bill and I were given the opportunity to visit the graves of Mansel and Marion. 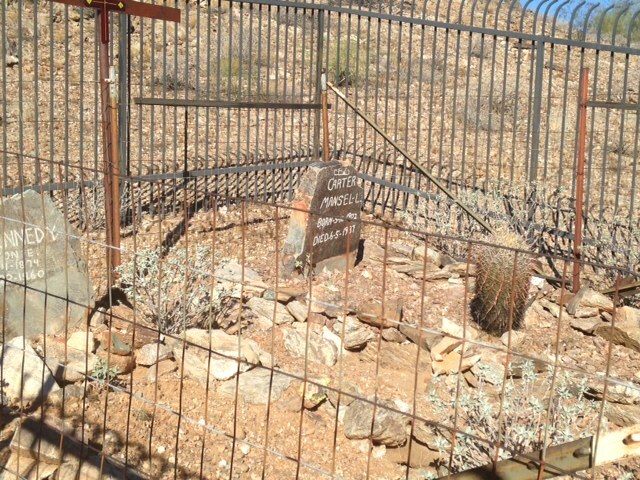 I took the opportunity to capture these pictures of the gravesites while I was there. 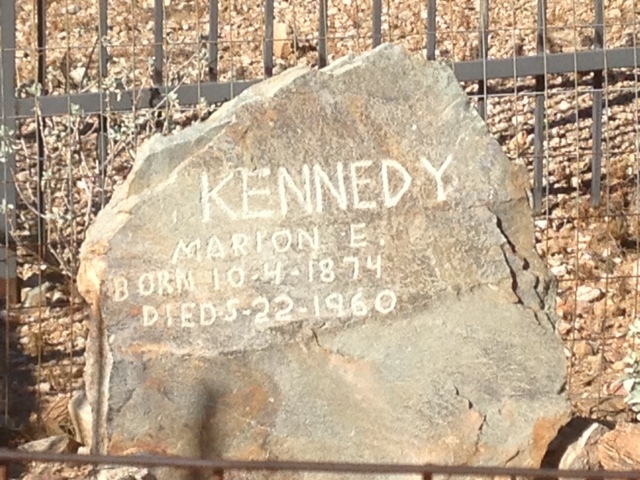 This is the grave of Marion Kennedy.